After years of bitter feuding, Angelina Jolie may be ready to mend her relationship with her estranged father, Jon Voight. She told London’s Evening Standard, "I am hoping my relationship with my father will be more private in future." That’s a big step for the 32-year-old actress. She’s been very public about her resentment against him for cheating on her late mother, Marcheline Bertrand. 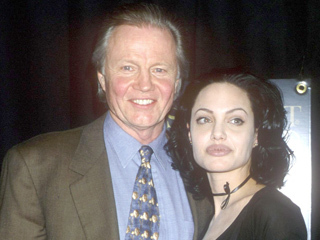 The big blowup came when Voight said in a 2002 interview that Angelina needed to "get help" for "serious mental problems." But after building a great relationship with partner Brad Pitt’s parents, and experiencing the joys of being a parent herself, Angelina could be looking for the same with Voight. "At the end of the day we both wish the best for each other and we'll try to start communicating in some way," she said.